Philip and Jocelyn Wagner were fed up with Prohibition when they planted their grapevine nursery in Maryland during the early 1930s. This was quickly followed by the publication of the informative book ”American Wines and How to Make Them.” By 1945 the Wagners had established Maryland’s first commercial winery Boordy Vineyards. These wines spread in attraction, for example, throughout the 1950s they were available for purchase in Washington, DC at the Fred Burka shop on Wisconsin Ave at Macomb Street. One advertisement featured the “fine dry white” at $1.35 in December 1951. Philip Wagner was not just a farmer and winemaker, he was also an editorial writer at The Baltimore Sun. It is through this position that the wines of Boordy Vineyards came to the attention of Allen W. Dulles the Director of the Central Intelligence Agency. The Baltimore Sun was in the eyes of the Central Intelligence Agency as early as 1955 when Stanley J. Grogan, Assistant to the Director, suggested Mark Watson of The Baltimore Sun, amongst others, be invited to a conference with the Allen W. Dulles. By March 22, 1960, Philip Wagner and Allen W. Dulles had met. 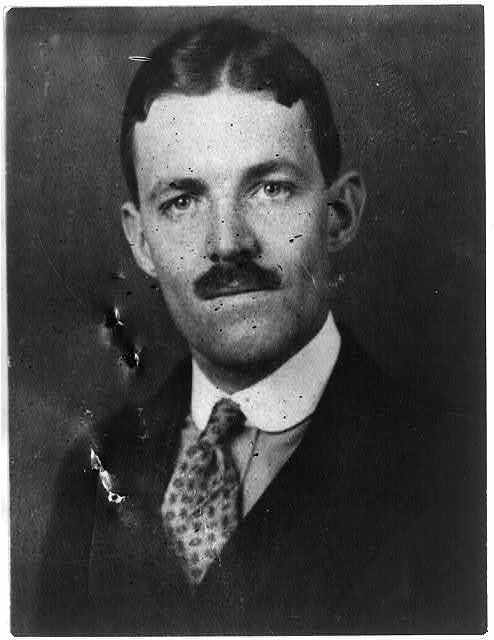 Philip Wagner had sent “wines of Boordy Vineyard” to Allen W. Dulles who thanked him and remarked, “I am anticipating with great pleasure the first taste of wine”. 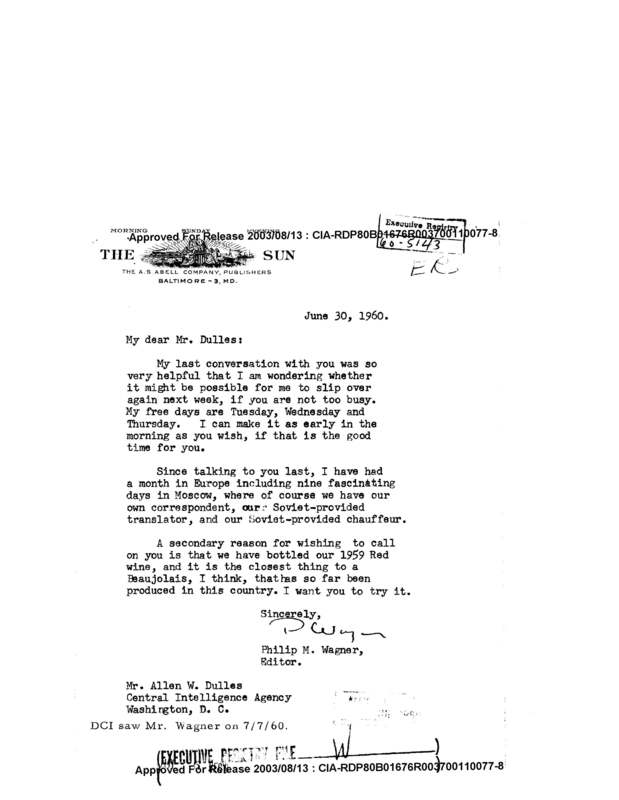 On June 30, 1960, Philip Wagner wrote to Allen W. Dulles that their “last conversation…was so very helpful” and that he wanted to “slip over” for another meeting. He continued that “A secondary reason for wishing to call of you is that we have bottled our 1959 Red wine, and it is the closest thing to a Beaujolais, I think, that has so far been produced in this country. I want you to try it.” We do not yet know what Allen W. Dulles thought of the wines but it does appear clear that these two men shared a common interest in wine. Allen Welsh Dulles, 1893-1969. ca. 1920? National Photo Co. Library of Congress Prints and Photographs Division. The Washington Post (1923-1954) [Washington, D.C] 06 Dec 1951: C13. U.S.S.R. Political. Pergamon World Atlas. 1967. 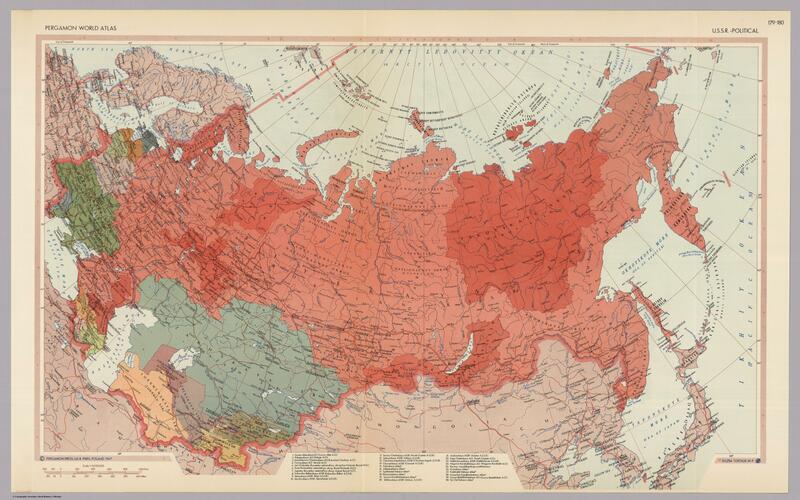 David Rumsey Map Collections. The narrative appears under the heading “The Trap”. One June 21, 1961, he departed Moscow for the Caucasus and Central Asia. As he had not taken any of the previous bait it became clear that his handler “decided that the time had come for more direct action.” Having arrived at his hotel in Tashkent at 9:30pm he dined at the hotel restaurant then took an evening walk around 11:00 or 11:30pm. The streets were not “well lighted” and “particularly deserted” until a car drew up beside him and “two husky men in civilian clothing” jumped out and approached him. Without a word they seized his arms but he was able to surprise them and “wrench” himself free. They were not runners and he soon “outdistanced them.” He remained hidden in a courtyard where he “considered his next step” and concluded he was “faced with a deliberate attempt to trap.” After time had passed he crawled out from underneath a wooden gate, “ripping his shirt in the process”, then spent the night on a bench. The next day he caught a plane to Samarkand where he was met at the airport by an Intourist guide. After a “strenuous tour” he ate dinner at the hotel where he had “a bottle of the local wine”. Around 9pm he set out for a walk in a sort of amusement park which adjoined the hotel. It was well lit and full of people. He subsequently ran into the Uzbek man who sat next to him on his flight. The Uzbek man was with his brother’s “very attractive” fiancée and invited him to come home to meet the family. In weighing “the pros and cons” he decided this “had been too much of a coincidence to be planned” and thus accepted their hospitality. There were roughly 20 people at the house and they sat around to “sample the father’s homemade wine.” The Voice of America was playing on the powerful radio as various family members entered and left. The father and “aged mother” stay and engaged him “in lively conversation.” Around midnight he caught a taxi back to the hotel but asked to be dropped off a few blocks away. As he turned to go down his street “three men suddenly jumped [him] from the shadows. This time there was no escaping”. He was hit, kicked, and then rolled into a concrete drain where he lost consciousness. 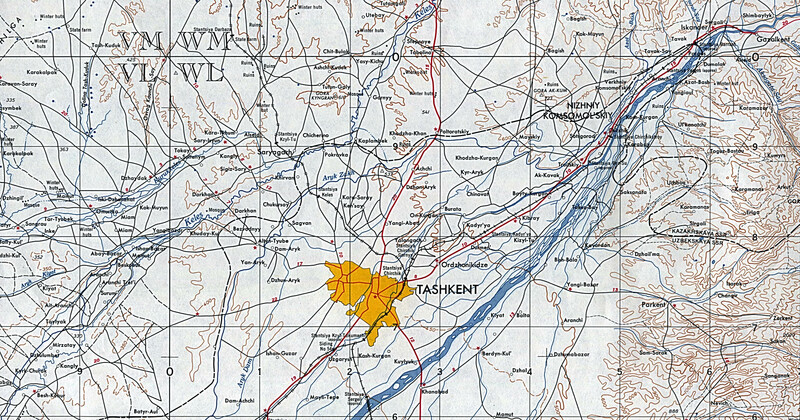 Tashkent, U.S.S.R. (topographic) [Current: Tashkent, Uzbekistan] Portion of Series N502, sheet NK-42-8, U.S. Army Map Service, 1957. Perry-Castañeda Library Map Collection. University of Texas. At midday the Colonel of the militia arrived stating he had assaulted a woman on the street. The supposed victim, a Mme. Svelova, was brought in and recounted her story with tears. He apologized “while denying any knowledge” and agreed to pay for the dress. 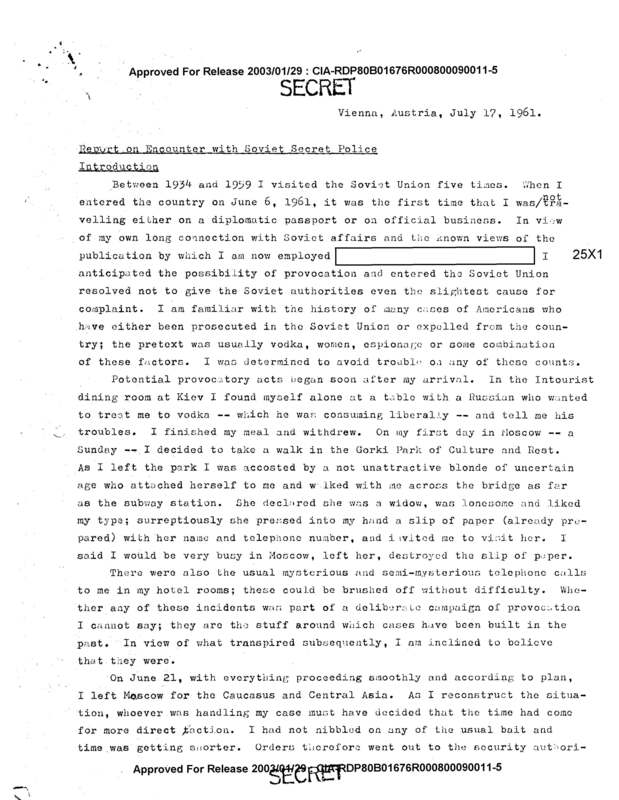 He decided to continue in Russian rather than English which would involve an interpreter and run the risk “of error or misunderstanding from poor translation.” He rejected the idea of legal counsel for they were “not noted for providing any great assistance” as well as contacting the embassy to avoid making an international event that would “make it much more difficult for the Soviets to drop it”.